Avery Corner Lock Document Sleeves give you all the protection of a traditional document sleeve with the added security of the Corner Lock feature. These durable Avery plastic sleeves are sealed on two sides to allow easy access to documents while keeping them looking fresh and sharp. The special Corner Lock fits snugly over the clear front cover to ensure that your documents don't accidentally fall out. Avery templates and software provide easy customization of title pages. There are six document sleeves in assorted colors (two blue, two green and two purple). 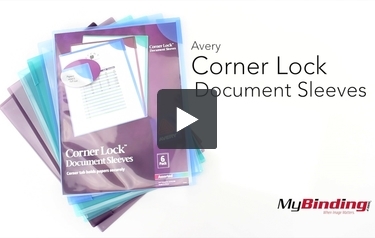 So glad you sell the Avery Corner Lock Document Sleeves! They come in very handy for organizing important papers and also for travel documents, recipes, and many other uses. The quality is excellent. Ordering and shipping are easy. These are Avery Corner Lock Document Sleeves! I am demoing here the normal sized sleeve. They are a very simple, yet practical product—insert your loose pages under the clear cover and slip the top right corner under the corner lock. Now you’re pages are secure. Here is 30 pages, it’s starting to get tight with this many pages, any more and I would upgrade to the high capacity sleeves of the same design. They come in assorted colors, and it looks like the high capacity and normal sleeves have different colors. Normal having purple, blue and green. They are attractive and practical, and they actually work well—I would totally use these if I actually had a need.